Erosion by water is a fundamental process creating landscapes on Earth and other planets. Determining the formation processes of river valleys and canyons, which are amongst the most widespread and dramatic landforms on our planet, is a prominent goal of geomorphology. Groundwater has been implicated as an important geomorphic agent in sub-aerial valley network development. This has mainly been done on the basis of morphologies, including theatre-shaped headed valleys with high walls and wide floors, which have been cited as diagnostic of groundwater activity. Similarly, groundwater processes had also been hypothesised to impact the geomorphology of passive continental margins in the early 20th century. Initially ignored because of the wider acceptance of the turbidity current paradigm, the groundwater hypothesis has been revitalised by more recent studies of slope failure and submarine canyon formation. (Left) Theatre-shaped valleys in the Apalachicola Bluffs and Ravines Preserve, Florida, USA. 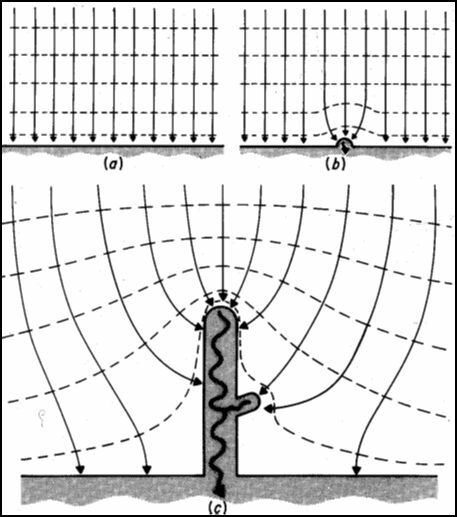 (Right) Schematic model of theatre-shaped valley development by groundwater seepage (from Dunne, 1990). 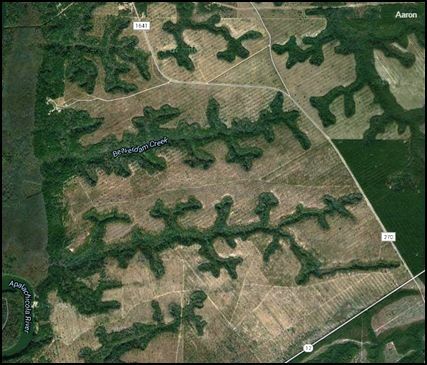 The role of groundwater seepage in geomorphology has been a subject of vigorous debate during the past decade. A diagnostic link between groundwater process and landscape form remains controversial and poorly quantified, whilst the formation of valleys by groundwater erosion has only been validated for unconsolidated sand. Experimental and numerical analyses have been based on simplistic assumptions about flow processes and the hydraulic characteristics of geologic media, and there is a general paucity of process-based observations and detailed instrumental studies. As a result, groundwater weathering and erosion processes in bedrock and cohesive sediments have not been quantified in terms of mechanisms, rates or resulting morphologies, which inhibits our ability to reconstruct and predict landscape evolution by groundwater. Morphometry-based inferences of groundwater activity are also highly debatable because theatre-headed valleys may not be uniquely associated with seepage erosion. A re-evaluation of the evidence that supports the role of groundwater in eroding canyons in particular, and in geomorphology in general, is thus necessary. This is especially relevant in passive continental margin settings, in view of the terrestrial focus of groundwater geomorphic studies and the limited understanding of offshore groundwater systems. 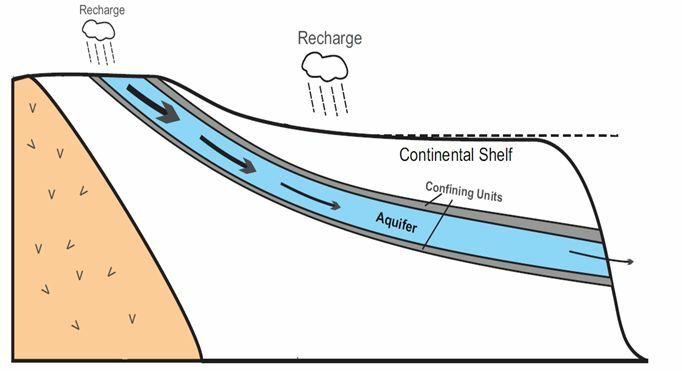 Meteoric recharge and topographically-driven flow are the most important sources of groundwater recharge in terrestrial settings. In passive continental margins, topographically-driven meteoric (TDM) groundwater is only one of a range of drivers of offshore groundwater flow. Other drivers include seawater recirculation, sediment loading, geothermal convection, and diagenesis. 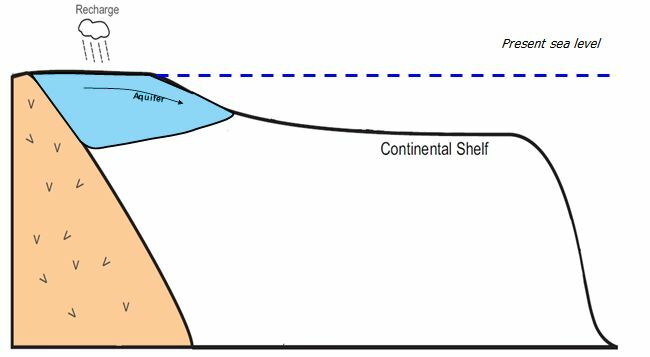 Sea level has been much lower than today for 80% of the Quaternary, resulting in the emergence of extensive sections of continental shelf, a reduction of pressure exerted by the sea water column, as well as steepening of the hydraulic gradient and an increase in hydraulic head. The potential of TDM recharge to establish extensive water tables, create massive groundwater fluxes, and generate pore overpressures and discharges across the continental shelf and upper continental slope must have been significantly higher during the majority of the last 2.6 Ma than it is today. Considering that geothermal convection is strongest beneath the continental slope and tends to be dominated by TDM flow during sea level lowstands, whereas sediment loading is most important during rapid deglaciations in high sedimentation zones, TDM recharge is likely a very important driver of offshore groundwater systems in continental shelves and upper slopes globally. Offshore groundwater systems driven by TDM recharge comprise two key elements that have received increased attention in the last decade. The first consists of offshore fresh and brackish groundwater reservoirs, which occur extensively around the world, have a global estimated volume of 5 × 105 km3, and can provide potential archives of palaeo-environments and valuable sources of good quality drinking water. The second is submarine groundwater discharge, which delivers volumes 3-4 times greater than rivers globally and directly influences biological processes and geochemical balances. and lowstands (right). (Adapted from Van Geldern et al., 2013). The characteristics and dynamics of modern TDM offshore groundwater systems remain poorly constrained, and there are many first order questions, related to aquifer geometry, distribution, characteristics and flow dynamics, waiting to be addressed. This mainly arises from a paucity of appropriate offshore data and rare geophysical and geochemical characterisation of offshore groundwater. As a consequence, exploration of offshore groundwater has had to rely on predictive mathematical models. These, however, have generally been based on limited well data, low resolution seismic data and poorly defined aquifer properties. They pay little attention to the land–sea connection and seafloor morphologic evolution during glacial cycles, despite these being proposed as key controls of some of the best-studied offshore reservoirs. The geologic environment influences the distribution and flow of offshore groundwater at several scales, but such a relationship has not been investigated in detail, and contrasting results have been reported. Offshore groundwater reservoirs are seldom in equilibrium with sea level. Current and past continental margin morphology and processes can only be understood in terms of a framework where sea levels are lower and TDM groundwater systems extend further offshore. Better understanding of the response of TDM offshore groundwater systems to the integral glacial cycle, and of how TDM flows can be geomorphically significant, is crucial. Understanding the architecture, history, and dynamics of TDM offshore groundwater systems has thus emerged as a new scientific frontier of critical value to seafloor geomorphology.